Every day, hundreds of thousands of Americans celebrate their birthday. Some of those birthdays are milestones — 18th, 40th, or, 80th, for example — and those times warrant extra attention. In some rare cases, a milestone birthday may even warrant a letter from the President, but that typically only comes after the celebrating person has already done something notable for his or her country. Rarely does that involve getting a haircut. That’s a pretty bad picture of a woman named Mary Babnik Brown, but there just aren’t a lot of photos of her — at least, not pre-haircut. Born in Pueblo, Colorado in 1907 and, as seen above, went a very long time without anything more than a trim. That old photo aside, she’d typically wear her hair in a braid, positioned atop her head like a crown. It became her hallmark of sorts; according to Defense Media Network, her hairstyle earned her the nickname “the lady with the crown” locally. But beyond being a passing curiosity in her community, Brown and her hair were hardly a point of national security. That wouldn’t happen until 1943. That year, a Pueblo newspaper ran an ad noting that the government was seeking women’s hair. And not just any hair would do. Per the letter she received upon her inquiry, the hair had to be naturally blonde, as Brown’s was; in fact, it could never have been chemically treated, and Brown’s had never been. It also had to be at least 22” inches (56 cm) in length or longer. The reason: blonde, untreated hair was particularly useful in meteorological instruments — equipment used to measure changes in temperature, barometric pressure, and more. As one could imagine, getting an accurate read on that type of information could mean the difference between a military success and a failure. Brown, wanting to support the war effort, agreed to have her first haircut. The government offered her war savings stamps in exchange for her hair, but Brown declined and donated her hair instead. That, in and of itself, would have made for a great story — a young woman does her part to support the troops by… getting a haircut. But then, the story gets strange. Something happened that probably didn’t, and we’re not sure how or why. Somewhere along the way, someone — it’s unclear who — informed Brown of the government’s “true” reason for wanting her hair: not for research, but for targeting. The Norden bombsight — a mechanism used by American bombardiers to aim their bombs at their intended targets — was considered one of the most important technological advancements of the era. (Per Wikipedia, “bombardiers were required to take an oath during their training stating that they would defend its secret with their own life if necessary” and the sight itself came with a self-destruct mechanism which, if triggered, “would melt the Norden into a lump of metal.”) The bombsight — which was used in many contexts, but also to target the atomic bombs dropped in Hiroshima and Nagasaki — had to work well or unintentionally bad things were sure to follow. That means the sight’s crosshairs had to be perfect. And Brown had perfect hair. Brown was later informed that her hairs were used as the crosshairs in the bombsight. 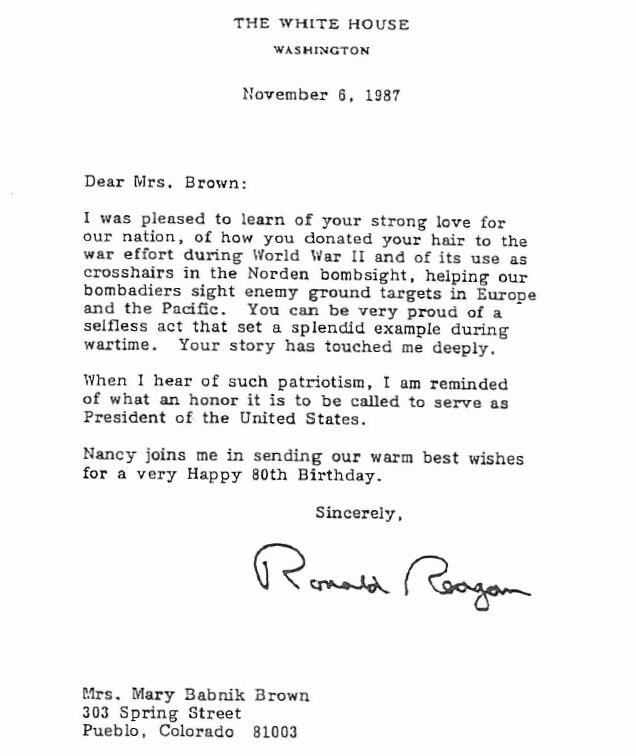 Years later, she even received a birthday note from President Reagan — seen below — thanking her for her donation, and acknowledging her hair’s use in this manner. Still, Brown’s donation was a critical one. The hair was definitely used in meteorological instruments, as she had been informed, and the War Department relied on those meteorological instruments in many different contexts. Brown probably still deserved that letter from the President — even if some of the facts are probably wrong. From the Archives: A Hair-Brained Rule: North Korea’s inflexible, haircut-by-number system. Related: “The Legendary Secret Norden Bombsight” by Albert L. Pardini. 4.5 stars on 7 reviews.